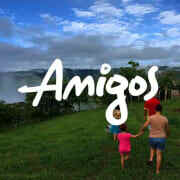 AMIGOS is the safest, most immersive volunteer program for young people in Latin America. We provide extraordinary opportunities for volunteers to work on community service projects and live with host families in local communities. Since 1965, AMIGOS volunteers have volunteered in Latin America, learning about the world by living in it. AMIGOS gives young people the chance to gain life experience that is impossible to get in a classroom. Together with U.S. and Latin American peers, volunteers live in a new country and work on community service projects. This creates an opportunity for youth to grow and develop their leadership skills. Living with host families is an authentic cultural and language immersion experience that builds confidence in Spanish and prepares them for their future by learning to thrive in an unfamiliar environment. Volunteers learn and practice skills that will set them apart in college and throughout their career. Our program model includes Latin American volunteers, partner organizations, and communities. By collaborating across cultural contexts, AMIGOS volunteers develop tools they need in order to thrive in an increasingly global and connected world. AMIGOS empowers young people with life experience that instills confidence. The success of our 28,000+ alumni demonstrates that young people rise to meet the challenges they face and carry this energy, focus, and perspective into successful careers in college and beyond. Would you recommend Amigos de las Americas? I was a volunteer in the summer of 2013 in Azuay, Ecuador, where I lived in an Indigenous community high up in the Andes. My community was a bit different from neighboring Mestizo communities, which allowed me and my partners to immerse ourselves in a culture that not many outsiders get to experience. We completed a CBI (Community Based Initiative) project in collaboration with community members, and also facilitated workshops with kids in the community which was a lot of fun. My time with AMIGOS drastically improved my Spanish as well as my leadership skills such as fundraising, organization, and facilitation. I attribute my success in college to AMIGOS, and I feel like I am a very independent and goal-oriented person today because of my volunteer experience. AMIGOS is such an incredible organization because of the amount of freedom it gives high school students and its incredible support network in the US and Latin America. I cannot say enough good things about AMIGOS! AMIGOS is unique. It is the only international exchange program in existence that trusts volunteers to be independent and leaders, challenges them to achieve what they think they cannot, and provides a truly immersive experience. I was a volunteer in Nicaragua where I lived in a community of 300 people, and in Honduras the next year. I am still in touch with my host families 10 years later. AMIGOS provides opportunities to be creative, to take on increasing responsibility and leadership from the start, and the most rewarding summers imaginable. Amigos is a phenomenal organization in the sense that it gives young people the opportunity to experience another culture independently as a young adult. Amigos volunteers are held to high standards, and as an organization Amigos has proven time and time again for the last 50 years that teens can rise to the occasion and implement some of the most impactful community based development projects that I have ever seen. I have worked with many volunteer "service" and leadership programs over the course of my high school career, and one thing that seems to plague many travel volunteer experiences for youth nowadays is a sense of "voluntourism" that puts the experience and development of the volunteer far ahead of the volunteers work with a community or project of any kind. Amigos not only avoids the exercise of this paradigm, but fosters the polar opposite by giving volunteers a truly immersive experience and fostering the importance of genuine connection with culture and community. I would definitely recommend this to anyone!! Not only is this program a great way to meet new people and learn Spanish, but it's a different experience for everyone. In Veraguas, Panama, I worked with the support of two partners and a supervisor to become a community leader and to make change happen. Teaching schoolchildren about the environment and collaborating with the national health ministry, we got work done while being exposed to a different culture. We got all of our teenage friends in the community involved in a project to improve the local church building, chosen by a house-to-house vote. We also helped organize new trash cans for community areas. The goals of Amigos are admirable, and as a young person in a foreign country you can empower yourself to carry them out! It is a wonderful opportunity! This program is amazing! I went to the Dominican Republic for two months with AMIGOS this past summer and had an absolutely fantastic time. I got to learn about a new culture, strengthen my Spanish skills, work with my host community on projects, teach classes for younger children, and truly become part of my community. There is no other program like this one, don't miss out!